Two recent news items should be enough for serious investors to short sell nuclear power stocks. The first piece is a cheery story from Germany. Germany produced 22 gigawatts of solar power that were fed into the national grid on Saturday that met 50% of the nation’s midday electricity needs. This is more electricity than 20 nuclear reactors at full production. Germany only has 17 reactors total, 8 of which were closed after Fukushima, the rest of which will be shuttered by 2022. Perhaps LA and Houston could follow Berlins lead? Baseload: Wind and photovoltaics can’t keep the lights on because they can’t run 24/7. Footprint: Photovoltaics need 150 times, and wind farms over 600 times, more land than nuclear power to produce the same electricity. Portfolio: We need every tool for combating climate change, including nuclear power. Government role: The climate imperative trumps economics, so governments everywhere must and will do what France did — ensure that nuclear power gets built, regardless of economics or dissent. Germany is proving these all wrong. Clever Germans have optimized their power grid so it can handle up to 50% feed in from a completely intermittent source. I’ve read several articles by critics of the German renewables strategy, none even mention footprint, this is a non-issue. At these levels Germany can look seriously at wind and solar as dominant players in their energy portfolio. And clearly the governments role by legislating the highest electricity prices in the world, including Feed In Tarrifs (FIT) to level the playing field for solar, is having the desired climate change effect. Even with nuclear rapidly declining. Germany has nearly as much installed solar power as all the rest of the world. Over half of Germany’s renewable power generation is owned by individuals. FIT are vanishing quicker than originally planned, because PV prices have dropped. It is worth talking about FIT a bit, because it is the strongest argument against solar. German power users pay about $6 billion a year in solar subsidies. The Japanese are looking at easily $250 billion for the cost of Fukushima. That is all we really need to say about Feed In Tarrifs. The other piece of news is far less cheery, but possibly more important, despite being hidden away on the technology pages of most newspapers. 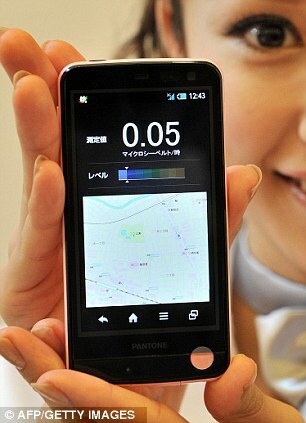 The Japan’s #3 cell phone maker, Softbank, has announced a mobile phone which detects and maps radiation. What the articles about these phones does not say, but is the clearly blaring future technological reality, is that this type of phone will spawn a social network. In this new network there will be a tremendous independent shared data set about nuclear hot spots. These phones, with casual and dedicated users will map millions of hot spots and long term uninhabitable locations. Imagine yourself as an affluent retired Fukushima refugee. Someone who can never go home, but still has money and anger. What might you do? You might start scowering the country side for hot spots. You might even think “i will sacrifice my own long term health so my grandchildren know where this invisible poison is” The more lethal locations show up, and there are already some mapped, the less likely it will be that the 50 closed reactors in Japan will ever re-open. Imagine yourself the mom of a young child, you will network with your other mothers to find safe spaces for your kids to play and go to school. And one day a bad storm blows in a bunch of radioactive debris and you have to leave your town which has been safe before. Because it turns out fallout is just that fickle, only we did not watch it before. Simply put, these devices combined with social networking will begin to map the real effect of Fukushima and when the world sees it, it will be very hard to build more reactors. It is quite a technical challenge to store enough energy to supply power to the grid when the sun is not shining. Starting and stopping gigantic turbines compounds to this challenge, plus the panels themselves are expensive and quite susceptible to damage and thievery. I believe nuclear power is a useful tool in the right conditions, and provided it is done safely. However, it is clearly not a good choice for the earthquake and tsunami prone Japan! With all due respect, your completely wrong about nuclear. It is certainly the case that saving intermittent energy is tricky, and highly doabe, especially because solar production often corresponds with peak us for air conditioning. Paxus: I agree that economic conditions are currently not in favor of nuclear power, but who would have predicted that oil would be at $90/barrel in the summer of 2012? If it were 200 or 300, as people were thinking it would be, it would be a very different story! I agree that it is certainly possible to rely solely on renewable energy, but the technical challenges involved would be huge. I’d imagine it would take somewhere along the order of 10 Terawatt hours of energy storage capacity just to last a single night. It would be a monumental feat in it’s own right. Doable, but by no means quick, cheap, or easy. The biggest hurdles to renewable energy however, are political, rather than economic or technical. Those who are in power have a vested interest in maintaining the status quo. 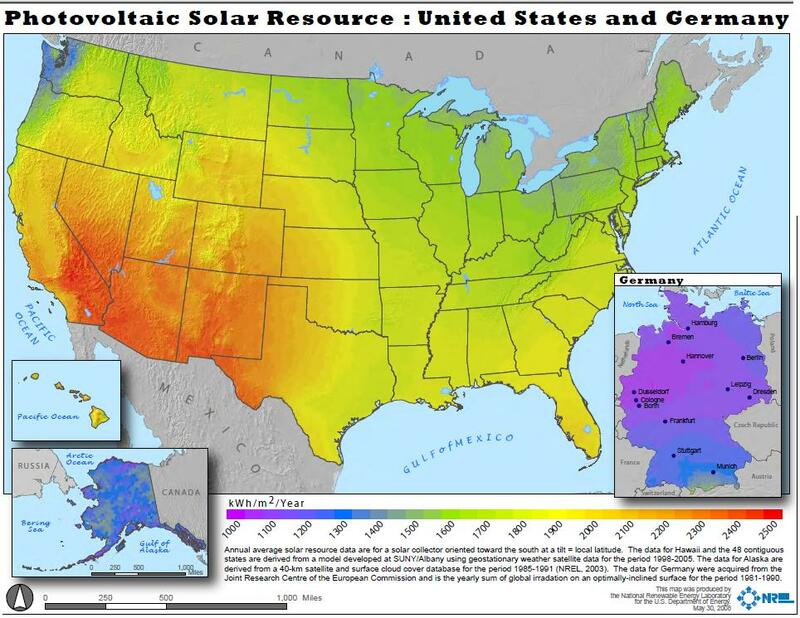 Remember also, that petrol in Germany costs 3-4 times as much in US, so the economics are tilted much in favor of solar relative to other places. The economic conditions have never actually favored nuclear power, as you point out it is a political problem. For example, despite the over US$250 billion price tag for the Fukushima accident, no utility, nuclear construction company or pro-nuclear government thinks the price of this power source has increased at all due to this triple meltdown. Electricity prices as well in Germany are higher – $6 billion per year in solar subsidies. But this is very little compared to accident costs, like the two we almost had last year in Nebraska. It is technically challenging to have lots of intermittent sources. And a mix of renewable sources including hydro for baseload can get you there. There is quite some interesting work done on solar and wind complimentary availability. This is what we need clever engineers for. And Japan has just put in feed in tarrifs, the US could go the same way. Patrick Moore talks about feed in tarrifs in this presentation. The presentation is pre-Fukushima so what he says at the end about Europe’s nuclear plans is out of date. Otherwise, it is an excellent presentation. On paper, nuclear power has the potential to be a very cheap source of electricity, but if the clean up costs from melted down reactors are factored in, it is not. I don’t know what developers were thinking in putting a nuclear power plant in the middle of a metropolitan area, But then again, hindsight is always 20/20. Nuclear power is only cheap on paper, when you are believing highly paid nuclear sales people – who have consistently underestimated the cost of reactors to sell them. By saying “On paper, nuclear power has the potential to be a very cheap source of electricity” what it says to me is that you have not done the most minimal level of research on this topic, including readign the Lovins piece i already sent you. I am willing to talk with you about reactor costs, but only if you have done the most basic research so you know what you are talking about. This is before meltdowns are considered. US reactors are over 200% over budget. Watts Bar 2 just blew it’s budget by $2billion, Vogtle is already running over budget and they are hidding problems. It takes no hide sight to know nuclear is a bad investment, i can give you very critical World Bank analysis of reactors from 1980. What we know is the huge corporations can sell expensive products which endanger the public and dont pay for themselves, even if independent analyists repeatedly point out this is a mistake. As we have. Please dont quote more industry platitudes to me, it is infuriating. Here’s a question I would propose to you know though: Why do you think anyone would want to build a nuclear power plant? There are lots of good reasons to build nuclear power plants. Dominion Resources is the largest campaign contributor in Virginia, they give money to politicians who do what they want – if you are a politician and you want money, you can get it from Dominion by being pro-nuclear. Why does Dominion want them? because they believe they can continue to successfully push most of the costs of thee plants off onto the government as they have for years. Most of the waste costs, all of the insurance costs, the Bush nuclear incentives (which Dominion is not currently getting) include risk insurance, low interest construction loans, government guarantees for banks (which are critically important). More importantly, you want to build reactors, because they solidify your control of power sources as a utility. Solar and Wind are ramping up, you want huge installed base of nuclear if you can get it, because once they are turned on, we never turn them off no matter how dangerous they become (look at Vermont Yankee’s safety record, for example). This means guaranteed income for the utility – and reactors produce tremendous power, so it is a lot of revenue. Reactors appeal to male technophilic ego. You stand next to this big machine, which is very difficult to fully understand and say “it lights 100,000 houses with no carbon emissions” [The later of which is a lie] and the newspaper calls you a hero. And there is very little risk. Even at Fukushima, where the utilities and government were clearly mismanaging things dangerously, no one is going to jail. The number of people who lost their obs can be counted on one hand. In any other industry if you had a $250 billion accident, there would be serious consequences. Nuclear is strangely exempt. And of course you build reactors, because they are expensive to build and there are ample opportunities for graft along the way. We are just now having judgements against Marcos cronies int he Philippines who took millions from Westinghouse to insure the corrupt dictator bought reactors from them. This has been shown in multiple locations and of course the reason they do bribe, is because far more often they get away with it than they get caught. There are lots of reasons to build reactors. They are unethical and often illegal, but the reasons persist. Paxus: If you would allow me to further play the devil’s advocate – Why do you suppose that a government might want nuclear power so much as to offer such large subsidies? The best reason I can think of is for supporting a nuclear weapons program. If I were in the position of any country not named America, I would think that a nuclear missile would be the only suitable deterrent to keep from being attacked, as I would view more traditional military forces as useless outside of the context of suppression of internal discord, and the coercion less developed nations. P.S. I’ve never heard the term “male technophilic ego” before. Maybe I am just biased since I don’t spend much time away from technology, but I’ve always just reasoned that embracing technology is what it means to be human, and I don’t understand how there would be any relation to gender..